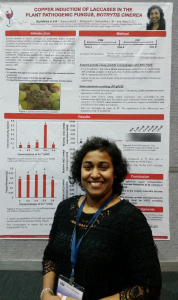 Aruni and her prize winning poster at Combio 2016. I am Aruni Buddhika, 2nd year PhD student from Charles Sturt University, Wagga Wagga, NSW. My PhD research has focused on understanding the role of laccases of Botrytis cinerea during grape infection. I am investigating the differential expression profiles of laccase isoforms during the infection process to elucidate the specific role of each laccase isoform during the infection. I presented some of my research findings at the COMBIO – 2016. I am delighted that I was awarded a student poster prize in the poster competition. This is a really great recognition for my research, and a great encouragement to continue my research carrier. I am really grateful for organizers from ASPS for awarding me the student poster prize. COMBIO-2016 was a great platform for me to learn new things and to share knowledge. The posters were displayed for three days and it was a great opportunity to expose my work for renowned scientist and researchers in the field. I really appreciate the questions, comments and suggestions given since, they will be useful in further development of my research. Plannery lectures were really informative and contained lots of new facts allowing young scientist to learn. Besides meetings, social gatherings were awesome, particularly the conference dinner which made us a great place to meet people and share ideas and knowledge. I am really proud to be a member of ASPS and looking forward to join with the next conference.